Definition Minimalism means exactly what it sounds like: a simple space with minimal accessories. The focus of minimalism is to achieve the most with the least. This means high-end finishes, simple-lined furnishings, and large windows to allow plenty of natural light and views to the outside. There is a connection with nature to create a zen space for relaxation. A clutter-free home allows for a clutter-free mind. This concept is something that is catching on again in recent years. After decades of exuberance and over abundance, people are looking to pair down to just the necessities, turning the concepts of Minimalism into a lifestyle rather than just a design style. History Minimalism began to take hold in the years after World War II and was a further development of Mid-Century Modern design. 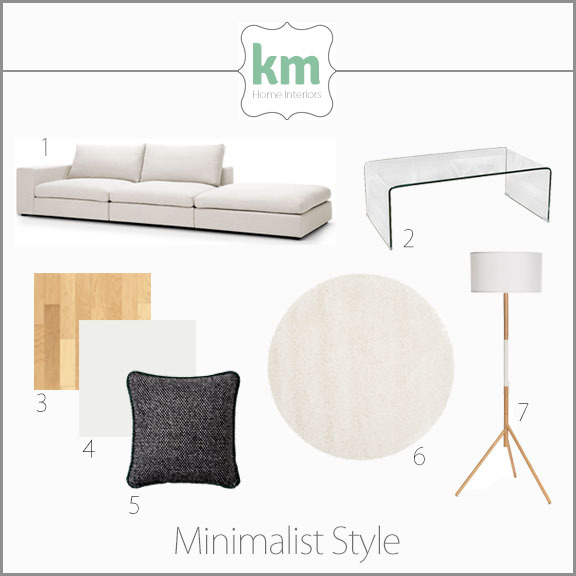 Minimalism took the pairing down that started with Mid-Century Modern and extended to the bare minimum essentials (hence the name “Minimalism”). One of the most important rules of design emerged from this movement. Ludwig Mies van der Rohe’s “Less is More” motto is still a guiding principle in design today. Spot the Style Minimalism is not just about simplicity, it is about luxury as well. This style often incorporates large walls of windows, exotic dark woods, bright white leather furnishings, and high end stainless steel details. Very few accessories are included in Minimalist spaces, allowing the design to be the star. A black and white color palette is often used, signifying upscale style. Notables Like Mid-Century Modern, some of the biggest names in design emerged during the Minimalist movement such as Mies van der Rohe and Tadao Ando, whose Japanese aesthetic was one of the bases of the Minimalist movement. With Minimalism coming back into fashion, there are many contemporary designers and architects creating stunning, simple spaces. One of my personal favorites is JM Architecture and his Lake Lugano House.